Background: Preeclampsia is multiorgan disorder, and important cause of maternal, fetal, neonatal morbidity and mortality, It is characterized by hypertension and proteinuria. Lipid peroxidation is an important factor in the pathophysiology of preeclampsia. Objective: To study the relation of lipid paroxidation which is measured by plasma Malondialdehyde (MDA) to preeclampsia. Design: Case –control study. Setting: The study was carried out at the Al-Imamain Al-Kadhemain Medical City/ Department of obstetrics and gynecology. Methods: The study included 70 women. We studied 30 patient preeclamptic women 30 apparently healthy women, 10 apparently healthy non pregnant ladies. Their age range between 18-30 year, gestational age is between 24-40 week /primigravida/non smoker or have evidence of nutritional deficiencies. Lipid peroxidation assessed by (Fong etal) method, and it is end products, particularly Malondialdehyde. Results: We observed that serum malondialdehyde were significantly increased in preeclamptic women (P<0.000) as compared to that of normotensive pregnant women. Conclusion: Increased levels of lipid peroxidation product –MDA may contribute to pathophysiology of preeclampsia. Background: Transperineal ultrasound measurement is now widely spread and easy to perform method for assessing progressive descent of the head through the pelvis by measurement of many parameters. One of these is the angle of progression which is found to be a successful method that assist obstetrician in predicting the success of induction of labor and the mode of delivery whether vaginal delivery or caesarean section. Objective: To assess the value of angle of progression (AOP) measurement by transperineal ultrasound in the prediction of the outcome of induction of labor at term whether vaginal or caesarean section. Methods: This clinical prospective study was conducted in Al-Yarmouk teaching hospital in the labor ward at the obstetrics department in the period from 1st of December 2015 to 1st of March 2016. Hundred nulliparous women with singleton, term pregnancy (37-42 weeks) were admitted for induction of labor for various reasons. Before the induction; transperineal ultrasound was done to measure the angle of progression. Comparism was done between the group who delivered vaginally and those required caesarean section regarding the difference in angle of progression and induction-to-delivery interval. Results: 77 (82.79%) were delivered vaginally and 16 (17.2%) required emergency Caesarean delivery. There were significant correlations between AOP and induction-to-delivery interval and the mode of delivery. AOP was significantly wider in those who delivered vaginally than women delivered by caesarean section. Conclusion: The measurement of angle of progression can be used as a simple and risk free method to predict the mode of delivery before the induction of labor. Background: The domesticated genes (Neogenes) in humans which arisen from the process of molecular domestication that occurred on DNA transposons may play an important role in the human genetic instability, and have evolved to have endogenous functions other than genomic transposition. One of these Neogene is nuclear apoptosis-inducing factor 1 (NAIF1) which inducing apoptosis in various human cancers. Aim: Study the expression of Neogene NAIF1 in colorectal cancer cell lines. Method: By western blot method we study the protein expression of NAIF1 gene in 12 colorectal cancer cell lines (HCT116, SW48, LOVO, DLD1) that are microsatellite instable MSI and (SW480, SW620, HT29, LS123, COLO205, T84, SW403, SW1463) that are microsatellite stable MSS and in healthy tissue of colon as a control in this study. Results: Protein expression of NAIF1 gene in all these 12 colorectal cancer cell lines with variable degree of expression and was seen strongly expressed in healthy colon tissue. Conclusion: NAIF1 protein expression inversely related with more advanced stage or grade of colorectal cancer in these cell lines (in other words, NAIF1 protein expression increase in colorectal cancer with high degree of differentiation). Pancreatic pseudocyst is an uncommon condition in childhood and is almost always associated with pancreatitis which may result from trauma or other rare diseases like biliary tract disease, viral illness & drugs or may be related to complications of metabolic diseases. However, unlike adult experience, trauma is the most common cause of pancreatic pseudocysts in children. Most pseudocysts are uncomplicated with few nonspecific symptoms, so they are challenging lesions to diagnose and to treat except when they are large. Therefore, a high index of clinical suspicion is necessary to make an early diagnosis & this require integration of careful medical history, clinical examination and laboratory investigations, but imaging studies such as ultrasound, computed tomography scan & magnetic resonance imaging are very helpful in establishing the diagnosis. Its management is markedly different depending on the cause and size of the cystic lesion of the pancreas. Initially the conservative approach for asymptomatic patients is preferable, on the basis that an appreciable percent of pseudocysts will resolve spontaneously, otherwise different surgical options may be implemented for symptomatic patients or when there are complications. We report a case of a large pancreatic pseudocyst in a four-year-old boy following pancreatitis due to blunt abdominal trauma by a bike injury. The child was treated conservatively for 4 weeks after the development of pancreatic pseudocyst then he underwent an open transgastric cystogastrostomy which was very effective and free of complication postoperatively. The presentation, diagnosis and surgical intervention are discussed. Back ground: caesarean section carries significant morbidity and mortality over vaginal delivery. Anemia with hemorrhagic complications add significantly for this morbidity and mortality. Aim of the study: to assess the effectiveness of Cyklokapron in reducing the intra-operative blood loss at time of caesarean section and postpartum hemorrhage in anemic patients and to evaluate its safety when used prophylactically. Patients and method: A hundred pregnant women aged 19 - 41 years with term gestation were recruited in this randomized, case control, prospective therapeutic trial, which was conducted for a period of one year at Al Yarmouk teaching hospital \ Baghdad \ Iraq, the participants were admitted for caesarean section. They were divided randomly into two groups; the study group 50 patients received intravenous Cyklokapron pre-operatively and a control group matched for the indication of caesarean section, the intraoperative, post-operative blood loss and hematocrit were evaluated and compared for both groups. Results: The intra-operative blood loss was measured in both groups, the total loss was significantly lower in the study group (170.12 ± 68.4 ml) compared to the control group (420.39 ± 130.6 ml) as P value was 0.0001 Concerning the post-operative blood loss, it was comparable in both groups and blood transfusion was required for two patients in the control group because of severe anemia (hemoglobin less than 8 gm\dl) with no transfusion in the study group and this difference was not significant statistically. The mean reduction in hematocrit was significantly lower in the study group compared to control group (1.52 ± 0.81%) versus (2.58±0.85%) respectively and P value was less than 0.05 Conclusion and recommendations: The current study revealed that Cyklokapron is significantly effective in reducing blood loss at time of caesarean section. We recommend further studies with higher doses and more patients to evaluate its effect in reducing the intra-operative loss and preventing postpartum hemorrhage. Background: Thyroidectomy is a very common operation. Bleeding is a major complication of thyroid surgery. However in the last 20 years there has been a dynamic development of new instruments, which had a significant impact on the improvement of old, and the introduction of new surgical techniques. Aim of study: To evaluate the homeostatic effect and safety of total Thyroidectomy or lobectomy, using electro-thermal bipolar diathermy or conventional vessel ligation. 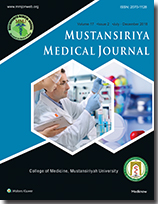 Patients and Methods: This is a prospective randomized controlled trial of patients need total Thyroidectomy, or hemi -Thyroidectomy performed in Baghdad teaching hospital and private hospitals from January 2012 to June 2014. Patients were assigned into two groups, group A (58 patients) had Thyroidectomy with the classic suture ligation technique and group B (62 patients) had Thyroidectomy with the use of electro-thermal bipolar diathermy of low voltage. We took into consideration in our study the operation time measured from skin opening to skin closure, and the amount of postoperative blood loss calculated in the 1st postoperative day and in few cases drains were left for 48 hours if the amount of blood loss in the 1st 24 hours was more than 200 mls between two groups. Results: 120 patients were enrolled in this study. We found that the significant difference is in the main operation time between the two groups: in group A 48.2 minutes in total Thyroidectomy, and 52.2 minutes in lobectomy, compared to mean time in group B 60 minutes in total Thyroidectomy, and 36.6 minutes in lobectomy. We found that there's a significant reduction in postoperative blood loss in group B compared to group A. Conclusion: Electro thermal bipolar removal of thyroid gland is an effective good alternative to classic suture and ligation and can be used safely with advantages of reduction in operation time and postoperative blood loss. Background: Traumatic war injury of peripheral nerves is a worldwide problem and can result in significant disability. Management of peripheral nerve injuries (PNIs) requires accurate localization and the assessment of severity of the nerve lesion. Objective: To assess the electrophysiological pattern of peripheral nerve injuries among Iraqi soldiers in the war and compare it with the experience elsewhere. Patients and Methods: A case series study was carried out in the Department of Electrodiagnosis of Al-Yarmok Teaching Hospital for a period from December 2015 to July 2016. Two groups of human subjects included in the present study: Control group consists of (50) healthy volunteers and the patients group consists of (136) with documented war peripheral nerve injuries (Iraqi soldiers) were included in this study, their age ranging from (20 years) till (49 years). Physical examination and electrodiagnostic study was carried with interventions both of the nerve conductive study (NCS) and the needle electromyographic study (EMG). The main parameters which were used in the study for the sensory nerves (distal sensory latency, amplitude, sensory nerve conduction velocity). For the motor nerves (distal motor latency, nerve conduction velocity, F-wave, latency, amplitude, decay, temporal dispersion). Needle EMG study (spontaneous activity, motor unit potential, recruitment and interference pattern). Results: There were (136) cases of war peripheral nerve injuries. The improvised explosive device (IEDs) was the main cause of the peripheral nerve injuries (PNIs) in (66%) of the cases followed by gunshot in (28%) of cases and (6%) of cases had (PNIs) secondary to fall from explosion, burial under debris and motor vehicle accidents. Most commonly injured nerves was sciatic (28%) followed by common peroneal nerve (22%), tibial nerve (11%), ulnar nerve (9%), femoral nerve (8%), median nerve (6%), radial nerve (6%), brachial plexus (4%), lumbosacral plexus (4%), musculocutaneous nerve (1%) and axillary nerve (1%) respectively. Conclusion: PNIs are a major component of war related injuries mainly involving upper and lower limbs. Electrodiagnostic studies in help in assessing severity and determining prognosis. Precise documentation of severity of nerve injuries is important to estimate the burden on our resources and to extended rehabilitation services. Background: Because of Parvovirus B19 that occur in patients with chronic renal failure; Parvovirus B19 was found to be associated with or might be an aggravation factor of renal failure, we tried to find out the rate of occurrence of this virus in dialysis and non dialysis patients. Objective: The aim of the study was to investigate viral load for Parvovirus B19 was play an important role in the etiology of chronic renal failure patients Subjects and methods: A cross sectional study included Serum samples were collected from 50 dialysis patients and 50 without dialysis patients 50 normal subjects as control, and subjected for ELISA technique for detection of parvovirus IgG antibody, and multiplex Real time PCR for detection virus and viral load of this virus Results: Thirteen (26%) out of these 50 dialysis patients were positive by RT-PCR and, 16% (8/50) were positive by ELISA, while none of the controls was positive neither by RT-PCR nor by ELISA. The results of this study showed highly significant differences (p<0.001) on comparing between the median viral load in patients who had dialysis (2.38×106) copies / ml of Parvovirus B19 DNA and those who without dialysis (1.73×104) copies/ml of Parvovirus B19 DNA. Also the results of B19 by real time PCR analysis showed a significant difference (p<0.001) in median viral load in patients who had acute infection (2.87×106) copies/ml of Parvovirus B19 DNA, than those who had chronic infection (2.29×105) copies/ml of Parvovirus B19 DNA, Conclusions Parvovirus B19 could be an important co-factor that play a role in CKD, which was higher rate in dialysis patients. Background: Red cell distribution width (RDW) was reported to be higher in patients with stroke. However, the correlation between the RDW and the stroke severity in terms of muscle power grading was not reported. Methods: The retrospective study involves 37 patients with stroke. “The Medical Research Council Scale (MRC) for Muscle Strength” was used for the assessment of the muscle strength. RDW% was calculated by Coulter Counter device. Results: The muscle power grading was significant and inversely (P<0.01, r = -0.604) correlated with RDW% and significant and inversely (P<0.01, r = -0.72) correlated with plasma triglycerides in patients with stroke. Conclusion: These results show an inverse association between muscle power grading in stroke patients with RDW% and plasma triglycerides. Background: Acute lymphoblastic leukaemia (ALL), it's clonal proliferation and accumulation of lymphoblast in blood, bone marrow and other organs. Objective: Evaluate of newly diagnosed ALL patients over three years, for their characters, risk groups and induction outcome Patients and Method: A prospective study included, (240) children below the age of 15 years with newly diagnosed ALL-LI and ALL-L2 (Precursor B or T cell) type, were eligible for study, Demographic, clinical, and laboratory data of ALL patients at presentation and at the end of induction were reviewed. Results: Of a total 240 ALL patients, only 221 of them participated in the study and underwent to the analysis. M:F ratio =1.3:1, (1-9.9) years, were more predominant age group. About two third of the patients were standard risk group. 91.4% of the patients with Precursor B cell ALL (PBC ALL). 4.8% of patients with initial CNS involvement, 85.5% (n 189/221) of patients completed induction therapy and reached 1st complete remission (CR1), while 11.3% (n 25/221), were died. The most common cause of induction death was infection (72%) Conclusion: The early outcome for children with ALL at end of induction therapy was suboptimal, while slightly high percent of induction death with some patients abandoned treatment; only 85.5% survived the induction phase. Background: Preterm labour still one of important causes of neonatal mortality and morbidity. Many researches on preterm labor were conducted in order to decrease the incidence, prevent complications, and improve survival rate for infants. Objective: To assess if salivary progesterone can be used sa a predictive marker for preterm labour and to compared it to the use of cervical length measurement. Study design: This Prospective observational study Setting: The study was performed at AL-Yarmouk Teaching Hospital at the Department of Obstetrics and Gynecology (Baghdad – Iraq) for the period from February 2015 to February 2016 Patients and methods: The study involved 60 pregnant women between 28 weeks-34 weeks gestation were divided into two groups; group A 30 patients with uterine contraction or history of previous preterm. group B 30 patient as control, cervical length of all patients was measured by transvaginal ultrasound, saliva sample (washings) also collected and the level of progesterone in the saliva was measured by ELISA and the results were compared. Results: statistical analysis of data showed that there was a significant relationship between salivary progesterone levels and preterm birth Sensitivity, specificity, predictive values (positive and negative) of progesterone were 96.7,90.0,90.6,96.4 respectively Conclusion: salivary progesterone can be used as a predictor of preterm delivery in high risk group.